What is Tadka? — Kitchenpostcards The only tempering you need! Tadka is the name of a popular radio station in India, it is also the word that is used to denote something sensational about a piece of gossip. It is the equivalent of adding spice to a conversation, a performance or to any situation really. But it all starts in the kitchen. Tadka is the Hindi, not Indian (since there is no language called Indian! ), for tempering. It is called by different names in different Indian languages, for instance it is called Poron in Bengali, Thaalithal in Tamil, Thalimpu in Telugu and Baghaar in Urdu. In English tempering is an action, a verb whereas in Indian languages it is both a noun and a verb. Tadka is added to every Indian dish, from dal to sabzi, which is a preparation of vegetables. You will need it for making biryani, for kadhi, for paalak paneer and also for the now popular and commonly known butter chicken. This post is going to send you googling, I know! Now to share with you the commonly used process of making a tadka, so here goes. Oil, about 4 tablespoons. Some recipes may require some more. Zeera, cumin seeds. 1 to 2 tea spoons. In some recipes depending on the region of origin the recipe may require mustard seeds. There are many variations and many combination of seeds that can be used. Green chillies, finely chopped, as required. Onions, chopped as the recipe calls. Garlic cloves, as many as you like but on an average 2-3, chopped. Ginger, if the recipe calls for it, chopped or grated. Tomatoes, as the recipe demands. Spices: a) Turmeric powder, 1 tsp. b) Red chilly powder, 1-2 tsp, according to taste, c) Coriander powder, 1-2 tsp, d) Black pepper, ground, 1-2 tspp, e) Salt, according to taste. Here, I am going to describe the tadka I made recently to temper black lentils. Black lentils are called Urad, and are usually cooked whole. This dal is a popular dish in northern India especially in the states of Punjab, Haryana and Delhi where it is called Maah-di-daal. Before preparing the tadka we need to cook the lentils in a pressure cooker. For one cup of lentils, which have been soaked for a few hours we will need about three to four cups of water. Don’t worry about adding too much water, it can always be evaporated! To this water add salt and turmeric powder and the lentils. Close the cooker and let it steam on high until you hear the whistle blow two to three times. Then reduce the heat and cook for another 45 minutes to an hour. Black lentils are tough beans to cook and they taste best when cooked on low heat for a long time. Once the lentils are done start preparing the tadka. See the full recipe for Maah-di-dal here. Heat a frying pan/skillet, then add oil. Next, throw in the cumin seeds. If the oil is hot they will start spluttering right away. To this add the chopped garlic and green chillies. Without letting the garlic burn add the onions. It is best to cook the onions until they are translucent. For the black lentils, tomatoes are used. So add the tomatoes and cook until they are soft and the water has evaporated. A trick to help the tomatoes cook faster is to add a pinch of salt. Due to osmosis, tomatoes as well as onions lose their water and cook down quickly. To this mix, add coriander powder, red chilli powder and black pepper. 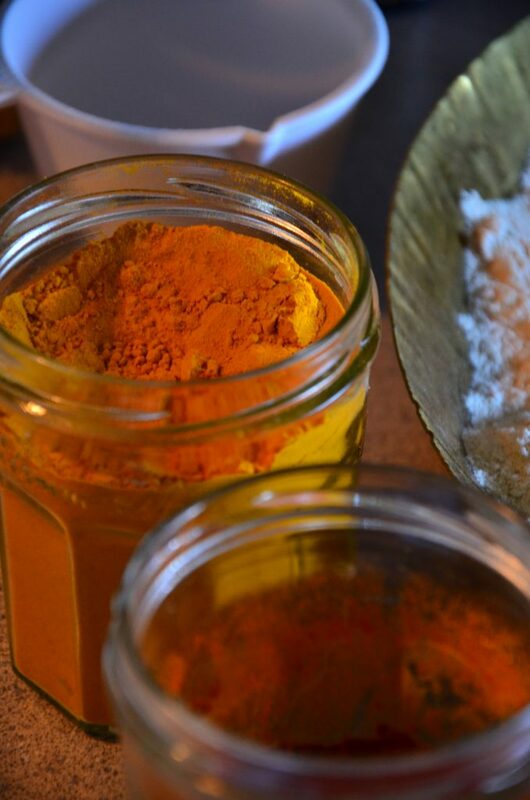 Typically, we do not add salt and turmeric since they have already been added to the lentils while steaming. But as mentioned above, a pinch of salt helps to cook the tadka. Continue to cook the tadka on medium or low heat along with the spices until for a while until they are aromatic. Finally put in the ginger just before turning off the heat. Preparing the tempering for Black lentils. The tadka is ready, add it to the lentils and mix well. I usually cook the lentils for a few minutes after adding the tadka. Close the pressure cooker and cook until you get one whistle. Turn off the heat. This helps to incorporate the spices and the flavours evenly. 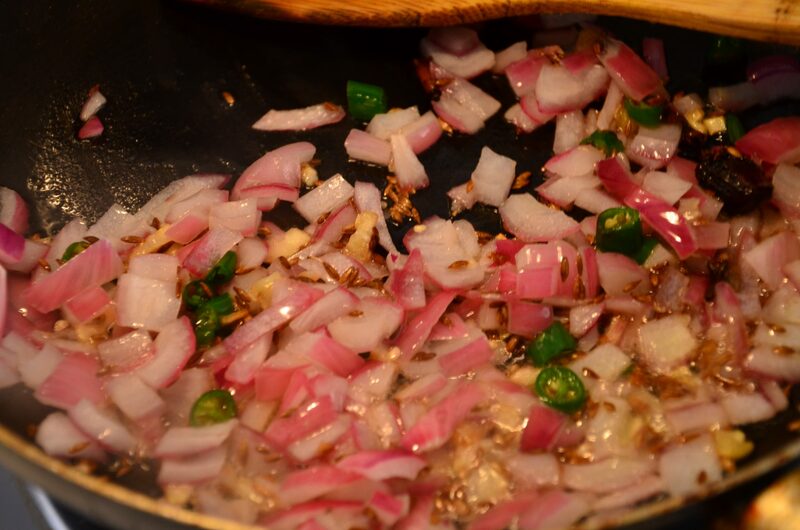 Garnish with freshly chopped green cilantro or coriander, as we Indians know it, and serve hot. Our recipes are peppered with lots of homegrown wisdom passed down the generations. Find more dal recipes on the blog. And hope you will add a spicy tadka to your next meal! Follow us on Instagram, Facebook and Twitter for easy, delicious recipes and tips.